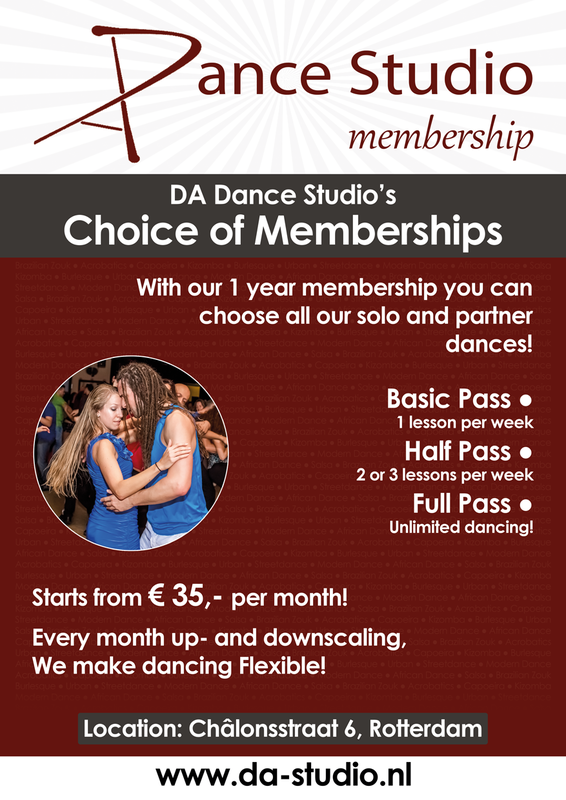 DA Dance Studio works with membership subscriptions. Every month you can upgrade and downgrade your membership. Our membership is for at least 12 months. We have 3 membership levels: basic pass, half pass and full pass. For students we offer a student basic pass with student discount. We use automatic monthly bank deductions for our membership. These deductions happen between the 14th and 21st of each month. You are always welcome to join for a trial lesson. Please reserve a spot by sending us an e-mail. We will send you a confirmation. A trial lesson costs €12,-. If you immediately sign up after your trial lesson you will get your trial lesson for free. If you miss a lesson you have to give us notice before missing the lesson in order to be eligible to catch it up. For partner lessons you need to make sure you have a partner. You can only catch up with lessons of your own level or lower. Catching up a missed solo lesson with a partner lesson (or vice versa) is also possible, come and try something else! A Trial Membership is only valid during the month of purchase. A Year Membership is for a period of 12 consecutive months. After these 12 months the membership will automatically be renewed monthly until notice. Time of notice is at least 1 month ahead, via letter or e-mail only. Up- and downscaling is possible every month, pausing the membership is possible for maximum 1 month. Pausing the membership will extend the membership period by 1 month. The first month is paid via PIN, cash or via the website. This price includes the registration & administration costs. Prices of the 1st month are equal to a trial membership. Payment of the second month and onwards is via automatic bank collection, authorization is required. For the happiness and safety of all our visitors we’ve drawn up a set of Terms & Conditions and House Rules. These are available at www.da-studio.nl and in the dance studio. Our dance classes and their membership are subject to our Terms and Conditions.